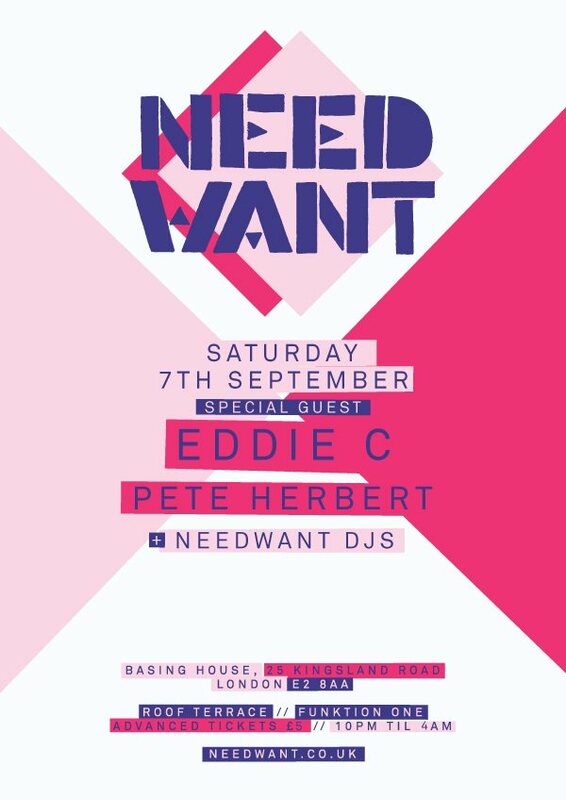 London label Needwant are coming up to their 5th birthday at the end of this year. They’ve released for an impressive group of affiliated artists, that include Urulu, Mario Basanov, Ejeca and Maxxi Soundsystem. To celebrate their birthday, Needwant are releasing a compilation of the tracks they’ve released along the way, with some new material chucked in for good measure. One of those new tracks is ‘Trust’ by Casino Times, remixed by FETE, and it’s great. There are also a couple of continuous mixes on the album which is always good to see, and Needwant are completing their five year festivities with two showcase nights, in London and Berlin respectively. The album is out Monday from a variety of sources. London label Needwant have been running nights at Shoreditch’s Basing House for some time now, with one line-up standing out as particularly fruity back in January. Heavy snowfall disrupted Ejeca‘s travel plans that evening but, with summer still desperately clinging on in the British Isles, next Saturday’s headliner Eddie C should have no such problems. For those not familiar with the unimaginatively-monikered Canadian, check out his recent mix for Beats in Space (below). He’s a seasoned veteran with a taste for disco and funk that is a pleasing antidote to the humourlessness that pervades many a London club night. Support comes from Pete Herbert, whose ambient tones will further enhance what promises to be a top night. Sound good? Head to our Facebook page to win yourself a shiny pair of tickets – or to Resident Advisor to buy some. Urulu continues to impress with his new jam ‘Lonely Weekend’. Showing off his slick production skills, he’s stripped down The Weeknd’s ‘Twenty Eight’ and turned it into a delightfully drawn-out deep house track. It’s as welcome as the news that the LA-based producer has recently packed his bags and moved East to London Town. As well as hopefully creating a load of live dates we can look forward to, this means collaborations like this can happen. Teaming up with Chaos In The CBD, ‘Never Again’ is a new EP out now on the hot London-based Needwant label. It combines old school and new school cuts and is a real delight. Very excited to hear more from this chap. This is one to get excited about. Headlining are Casino Times. The creators of our sixth favourite record of 2012 (no less) are on fire. ‘I Wanna Know’ was accompanied by ‘Trust’ at the end of last year, and new track ‘Heart Strings’ picks up where these two house bangers left off. It’s been an impressive few months from the Oxford duo and they promise to whip up what can only be described as a dancefloor frenzy on Friday. Support is provided by Needwant boss Sean Brosnan (not to be confused with his namesake, Pierce Brosnan’s son. For the avoidance of doubt, their respective LinkedIn profiles can be found here and here). The one we’re concerned with here is an extremely well-respected DJ, amongst plenty of other things. For more info on him, this interview from last year is great. “But how can I get tickets for this musical extravaganza?”, we hear you ask. Well, you can buy tickets here. Alternatively, we’ve teamed up with Needwant to give away a pair of tickets. Just let us know your favourite track of the year so far (in the comments below, on Facebook or Twitter) and the tickets could be yours. We’ll pick a winner at midday on Thursday (to give you time to mentally prepare yourselves), and we’ll use your answers to inform our January playlist (our Best of 2012 one is here). Very exciting new material from Ejeca. He’s previously wowed us with the toe-tapping ‘Around U Baby’ and the seminal hit ‘You’ with Bicep, but this new garage-infused track ‘Horizon’ really is promising stuff. Hopefully it’ll be stuck on repeat in a club near you soonish, and it’s released on Needwant on September 24th. Shame about the radio rip, mind.